In June 2018, Justin Sun of TRON acquired BitTorrent for $126 million, without disclosing his plans for the company. Media outlets were puzzled. But in the nine months that have elapsed, the reasons for the purchase have become much clearer: TRON is developing a new product (BitTorrent Speed), launched a brand new token (BTT) and, thanks entirely to BitTorrent’s millions of loyal peers, become the internet’s largest decentralized ecosystem. What’s the plan, and how does BTT fit in all this? What exactly did TRON acquire? Let’s avoid confusion. “BitTorrent” is the name of a) a peer-to-peer file-distribution protocol, b) one of the clients that connect to its network (also called BitTorrent Mainline), and c) the company based around it (BitTorrent Inc. was actually renamed Rainberry Inc. in 2018, but few know or care); all authored or co-authored by American programmer Bram Cohen in the early 00’s. What TRON acquired was BitTorrent the company. The BitTorrent protocol, created by Cohen in 2001, is an open-source, peer-to-peer (P2P) communication protocol for file sharing. It allows a network of peers to upload and download large files amongst each other in a relatively speedy fashion, by splitting files into smaller-sized pieces and letting those who have already downloaded become seeders for new downloaders. Clients can download the numerous pieces of a single file from different seeders, in any order. And, contrary to popular belief, BitTorrent does not solely traffic in illicit material. The protocol has been used by universities to distribute scientific datasets to researchers, by gaming corporations like Blizzard Entertainment to distribute patches, and even by Facebook and Twitter to distribute updates to their servers (according to Wired). In short, data is stored and transferred through a decentralized network of peers. One might say BitTorrent is, in this way, similar to the idea behind blockchain; minus the cryptography and the whole currency spiel. To anyone familiar with TRON’s original whitepaper, this acquisition didn’t seem like too much of a stretch. At its inception, TRON was presented as an art and entertainment distribution platform where content creators would sell their media directly to fans, saving on the cost of the middlemen. Compare this to some of BitTorrent’s business blunders — BitTorrent Entertainment Network (2007), a storefront for movies and music that lasted just a year; BitTorrent Bundle (2013), a failed iTunes-Amazon-type platform for artists to distribute their work at a fraction of the cost; and BitTorrent Live, a live streaming service which the company also gave up on quickly (at the time of writing it has been announced that the streaming service is being revived; this time powered by BTT). But if BitTorrent failed at these media platform attempts, why would TRON be interested? Well, though it’s true that in 2019 BitTorrent is not at its healthiest ever, the network is so huge that even in trying times it has appeal for investors. For the past year, BitTorrent has claimed over 100 million active global users (it was 170 million in 2017 according to Wired), comprising 97% of the internet’s upstream file-sharing traffic. To put this into perspective, file-sharing constitutes 22% of the internet’s traffic in total (all according to TorrentFreak). It’s true that TRON has not advertised itself as an entertainment platform in a while, but it is trying to single-handedly create Web 3.0, and tokenizing an internet network of over 100 million users is a good place to start. By harnessing BitTorrent’s popularity and protocol, TRON was able to gain some legitimacy, start development on a new product — a BitTorrent client called BitTorrent Speed, set for Q2, 2019 — and, of course, mint a new token. How did TRON justify a new token? Is this unfair to TRX holders? After all, those who invested from the very beginning were led to believe that TRON blockchain itself would become a content-sharing network, and that TRX, not a different token, would be used to power its economy. A mild sentiment of injustice did arise in parts of the community: take for example YouTuber SkrillaKings in this video. What is BitTorrent Token (BTT)? BTT is a TRC-10 utility token (based on the TRON blockchain). Through the client BitTorrent Speed, users will be able to seed and accumulate BTT when other users download from them. The BTT earned can then be bid in exchange for faster downloads, or stored in a wallet built into the client. It’s a tangible incentive to seed, and will, in theory, make the torrenting experience faster. There is no mining on the TRON blockchain, so there is no way to mine BTT. There is a total supply of 990 billion BTT and a circulating supply of 170.421 million BTT. 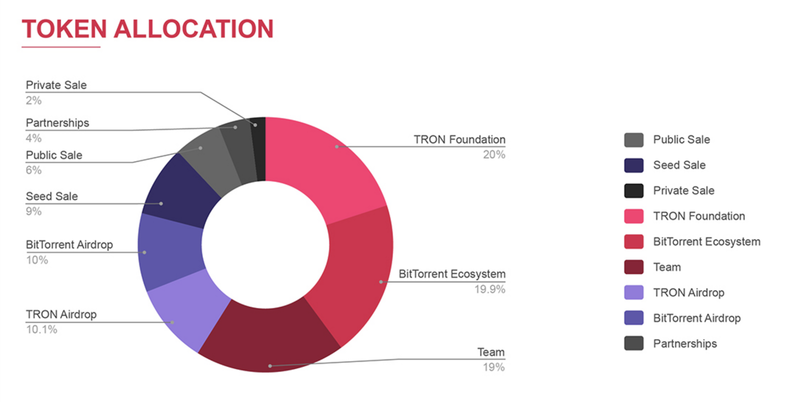 The following chart for token allocation was provided by the BTT Binance Launchpad. BTT tokens were sold on the Binance Launchpad on Jan. 28, in two simultaneous sessions: one where backers could buy BTT with Binance Token (BNB) and another where they could buy it with TRON (TRX). Each BTT cost $0.00012, according to official sale information. However, many users reported errors that prevented them from buying the token, and those who managed to get in within the first 3 seconds saw that 28.44% of the tokens had already been taken. Many suspected foul play. Binance CEO Changpeng Zhao addressed the errors on Twitter (here and here), and launched an extra airdrop of 5K BTT to users who failed to participate in the original sale. The size of the consolation airdrop left many users scratching their heads: 5K BTT were worth under a dollar at the time. Binance confirmed that all 23.76 billion BTT were sold in under 14 minutes in the BNB session, while the TRON session sold all 35.64 billion BTT in under 15 minutes. In total, 59.4B BTT (6% of the total supply), worth roughly $7.2M, were sold. On Jan. 31, BTT officially launched on Binance. For the full story on the controversial BTT Launchpad sale, read our article “Binance Launchpad: The BTT Sale Dissected, Part 1." On January 20th, BitTorrent announced a year-long BTT airdrop for TRX holders. BTT will be airdropped in a 1:1 ratio on the 11th of every month until 2025. The first airdrop took place on February 11th and distributed 1.1% of the supply. From March 2019 to February 2020, 1.2% of the supply will be distributed each month. With each following year, the percentage will increase by 0.1%: in 2021 the amount distributed monthly will be 1.3%, in 2022 it will be 1.4%, and so on, until 1.7% is distributed during each month of 2025. Binance, OKEx, Bithumb, HitBTC, and many other exchanges are backing this airdrop. BTT managed to gain 941.6% from its ICO price of $0.00012 on Jan. 28, to $0.00125 on Feb. 5. In the five days after that peak (still, it’s highest ever), it sunk down to $0.000733 (a 41% loss). BTT peaked twice more in February, at $0.001133 on the 12th and at $0.001053 on the 19th. During March, the token has hovered between $0.00072 and $0.000879 (the moth’s peak, on Mar. 17th). At press time, BTT is valued at $0.000787, an ROI of 52.52%. Final thoughts: how does this affect BitTorrent users? The advent of BitTorrent Speed is supposed to bring faster downloads and more seeds by making BTT into a monetary incentive to seed. Now, before blockchain came along, BitTorrent users already had incentives; those who uploaded faster got quicker downloads. It is true that many users just “leeched,” downloading data from seed peers and not allowing others to download from them. However, as YouTuber Ivan on Tech points out (here), the network was robust enough that, even with leeches, it still worked fine. The BitTorrent website reads “you’ll be able to choose to get things more quickly than you otherwise would”. But this was already true before. It is easy to argue that the BitTorrent ecosystem does not really need to be tokenized. The more pessimistic—though realistic—view is that introducing tokens will actually make the network less free, even though using BTT and BitTorrent Speed will be optional, because users will be incentivized to direct their bandwidth towards those paying — and of course, paying more is not an option for everybody. In that respect, you can even compare BitTorrent to Bitcoin: fees are technically optional on Bitcoin. You don’t have to pay. But it’s nearly certain that nobody will validate your transaction if you don’t. An interesting question for users now, is, will tokenizing the value of shared bandwidth and introducing a bidding system make the network better or worse?